On 29th of December 2012 a group of around 40 adults and children spanning 3 generations assembled at Muff Cross to view the planting of a horse chestnut tree. The tree was kindly donated by Patricia, Francis and Edward Cooney of Cooney Nurseries, Tierworker. The beautiful shaped tree was planted directly behind the horseshoe – shaped stone wall where it will provide a fitting backdrop to the work by local craftsmen. 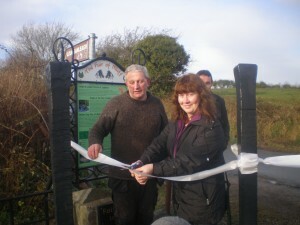 The ribbon was cut by Patricia Cooney at 12 mid-day in glorious sunshine. A vintage bottle of bubbly was cracked open to celebrate the occasion. Framed poems were presented to the main craftsmen Andrew Clarke, theblacksmith, and Eugene Lambe, the stonemason. Kevin Smith read out Andrew’s poem and Cormac Mc Mahon read out Eugene’s poem. The idea for a wall at the cross was the brainchild of Andrew Clarke in consultation with Niall Smith. He wanted a structure to commemorate 400 years of Muff Fair in 2008. As the fair is traditionally a horse fair it was decided to build the wall in keeping with the theme of horses. The iron crafted seat is in the shape of a horseshoe and has large nails shaped like those used by a farrier. The rings inserted in the outside of the wall are for tethering horses on the day of the fair, traditionally held on the 12th of August. The dealing and bargaining on the day is often sealed with a spit and a handshake when the price is agreed. 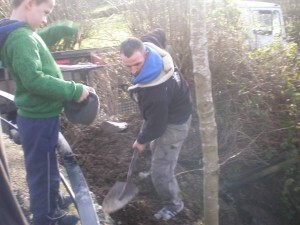 The construction of the stone wall was executed by Eugene Lambe with the help of Kevin and Tomás Smith and Brendan and Cormac Mc Mahon. Adrian Lambe RIP was the main overseer who kept a keen eye on all the proceedings from his wheelchair making sure there was no lagging on the job. It has taken a few years to get the work completed. In 2010 the main plaque was erected, again framed with the beautiful iron crafting by Andrew and family members, Raymond, Jonathon and Alan. The logos were designed by Conor Mc Mahon. It is important to point out that at all stages there has been a team of workers and supporters who lend a hand whenever it is needed. They willingly give their time and talents to making it a real community effort. The Fair has hit the headlines a number of times in the past year and has been featured on a number of television programmes, most recently Lesser Spotted Ulster. It is great to have our traditions and heritage recognised and celebrated. With the planting of the chestnut tree it is hoped that the youngsters there on the day will view the progress of the tree’s growth when this generation departs this life. An old Irish saying sums it up by reminding us of our mortality and that our work can live on despite it. Written by Alacoque McMahon, many thanks.